Devart LinqConnect supports Windows Phone 7 and 8. 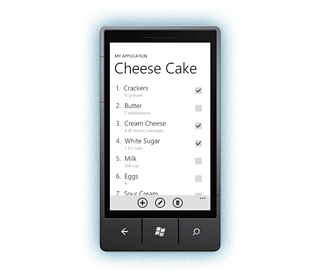 With it you can develop Windows Phone applications with true ORM support for database access. Moreover, LinqConnect allows using ADO.NET in Windows Phone for database access, which was not available for this operating system before. And in addition, it offers its own embedded database engine based on SQLite to store data in a fully functional local relational database in Windows Phone Isolated Storage. All LinqConnect ORM features - high performance, wide LINQ support, LINQ to SQL compatibility - are available for Windows Phone 7 and 8 completely. LinqConnect brings you the possibility to use LINQ in Windows Phone applications, which grants you such features as compile-time validation, IntelliSense, and your IDE's debugging mechanisms when building and testing your queries, etc. Though Windows Phone does not provide ADO.NET data access, with LinqConnect you can use ADO.NET and employ the flexibility and performance of the native database SQL in Windows Phone applications. LinqConnect ADO.NET data access allows you to move existing data access code to this platform, providing wider capabilities for porting desktop applications to Windows Phone. LinqConnect provides the same interfaces for accessing data on all the supported platforms. This allows you to share the same data access layer and domain layer between your application ports to different platforms, such as .NET Framework, Windows Phone 7, Silverlight, Mono, and Metro. For example, if your application should use SQLite database and be ported to Windows Phone, LinqConnect allows you to share the same code for working with data in desktop and Windows Phone applications. LinqConnect for Windows Phone can be used in XAML C# and Visual Basic applications. LinqConnect for Windows Phone contains the SQLite embedded database engine from C# SQLite project. You don't need to install any additional software, just use LinqConnect to work with a fully-functional relational database in Windows Phone Isolated Storage. Small and efficient, and at the same time powerful SQLite database engine together with ADO.NET and LINQ interfaces for data access make LinqConnect a perfect choice to store data locally in Windows Phone applications. Windows Phone itself does not provide the way to access data from database servers directly. To access such data, Microsoft offers one of the following ways: use Web Services, ADO.NET Data Services, or RIA Services that access data, materialize, serialize, and send them to your application in XML format. These ways involve the creation of additional data access layer that causes overhead for data serialization on the service side and deserialization on the client side. In addition, this increases the network traffic of the application because it transmits data in an excessive XML form, while database servers usually return it in much more compact binary form.